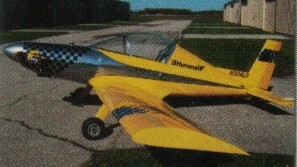 Hummel Bird began as a modified Watson Windwagon, but the designer/builder, Morry Hummel, of Bryan, Ohio, highly modified it and called it Hummel Bird, using the Revmaster R-800 rather than the half-VW. The LSA airframe has been modified and strengthened, tail area increased, and a locking tailwheel added for better ground control. A high L/D Schreder #3 airfoil and flaps also were used. Excellent single place aircraft. Features all aluminum construction. Fast and inexpensive to build, many were flying.